"Nega-Wisp Armor" redirects here. If you were looking for the boss in the DS version, see Nega-Wisp Armor (DS). Laser - The machine fires two lasers which you must dodge by jumping over it. They will move faster and shoot more as the machine takes more hits. Cube - The machine shoots cubes into the air, and they land on the track in front of you in a pattern. You need to be quick and maneuver through the formation the cubes make. After numerous hits, the cube formations will get longer and faster. Spikes - The machine fires a set of spike balls in a row at Sonic. Jump to dodge it. After many hits, this attack gets faster and shoots more rows. Cube-Laser - The machine first drops cubes in front of you. It then fires a laser through the cubes, which connects them in a pattern. Dodge both attacks. Cube-Spikes - The machine fires off the cubes, then once the cubes are in formation, it will fire the Spikes, which will move down the formation toward you. Dodge the spikes, and maneuver through the cubes. To attack this boss, after firing a number of its attacks, it will move closer to you. 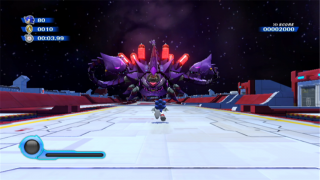 Once he does this, repeatedly use the Homing Attack to get to Eggman's Eggmobile and strike it directly. After this, the boss will hit the ground briefly; it is possible to do extra damage by boosting into it at this point, but this is not necessary in order to win. Attacking the Eggmobile releases two Wisps, one of each type until they are all moving with you. After a number of hits on the cockpit, all the Wisps you rescued will combine with your Homing Attack to do a powerful finishing blow against Eggman, destroying his machine. This page was last edited on 8 April 2018, at 09:45.